Turbocharger cartridge - made in England by Melett. Each Core Assembly is etched with a unique serial number, ensuring all genuine Melett products are fully traceable to the UK. PLEASE CHECK YOUR TURBO FOR THE OEM NUMBER AND MATCH IT TO THE NUMBERS IN ITEMS SPECIFICS ABOVE THIS ADVERT BEFORE PURCHASING. PLEASE DO NOT RELY ON THE VEHICLE MAKE AND MODEL!! 778401-4 778401-5 778401-6 778401-8 778401-10 778402-4 778402-5 778402-6 778402-4. LR063777 LR056370 LR038620 LR032370 LR029236 LR013205 LR021254 AX2Q-6K682-BF AX2Q-6K682-BE AX2Q-6K682-BD AX2Q-6K682-BC. This cartridge fits the turbochargers that are used in the following cars. Land Rover Discovery IV TDV6 ; 3.0 211 bhp ; 2009. Range Rover ; 3.0 211 bhp ; 2009. Range Rover Sport ; 3.0 245 bhp ; 2009. Jaguar XF ; 3.0 D V6 275 bhp ; 2009. Jaguar XJ ; 3.0 D V6 275 bhp ; 2009. Communication is very important and we will try our best to assist all our customers. We will dispatch the turbocharger only after the surcharge is transferred. We are not repsonsible for incorrect or undeliverable addresses. We do not offer local pick-ups. Items may not always be in stokc. Tracking numbers are also available upon request. We will be unable to further process the return until we have received this. Please note this applies even where the product is listed with P&P as free. If any part is received back in an abused/neglected and or dirty state or with no regard to protect it during transit we will simply return the part back to you. Please note all products must be installed by a qualified mechanic at registered garage. Based on the manufacturers opinion, we will repair or (at our sole option) replace such Goods with the same or superior Goods, without charge or not provide any of the aforementioned. The manufacturers opinion shall be final and binding and we shall have no further liability to you. Once the inspection has be completed we will issue a report with the findings. The item "Original Melett UK turbocharger cartridge Land Rover Discovery TDV6 Jaguar XF" is in sale since Monday, February 12, 2018. This item is in the category "Vehicle Parts & Accessories\Car Parts\Turbos & Superchargers\Turbochargers & Parts". 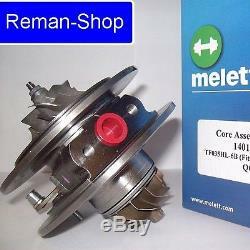 The seller is "reman-shop" and is located in Milton Keynes. This item can be shipped worldwide.